In this construction video tutorial, you will be familiar with the drawing of column section details. In the drawing, there are different types of information like the dimensions of rings in the column, the sizes of the rings, the dimensions of main bars, the position of lapping and it’s confining zone. All the dimensions are provided in millimeters and levels in meters until recorded otherwise. The dimensions should not be scaled. Only written dimension should be abided by. 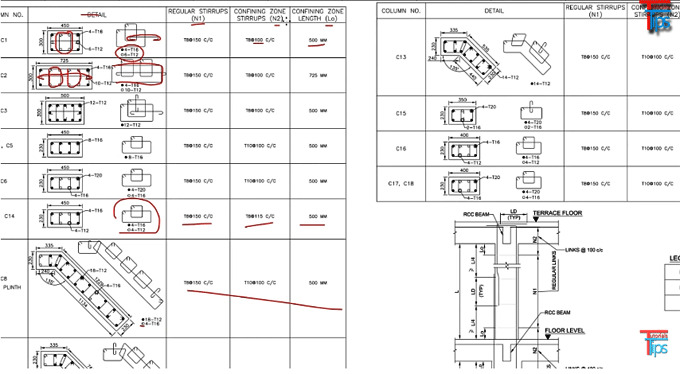 The drawings should be studied with reference to all structural, architectural, service drawings and specifications. For column, center lines stand for architects drawings. All the RCC work should be completed with M25 concrete design mix. All the hooks, bends, laps and splices should be similar to IS 2502. Lapping of bars should be perfectly staggered and in no case should be in excess of 50% bars should be lapped at any section. Lapping of bars for beam and slab should be ignored in the highest tension zone. Until noted otherwise the lap/anchorage length of bars with diameter D should be 40 X diameter of bar. To get details about the dimensions of regular stirrups, confining zone stirrups, confining zone length; go through the following video tutorial.